If you have a Chuggington fan in your life, this is one DVD you'll have to pick up to add to their growing Chuggington DVD collection. Or, why not pick up a copy when it arrives on DVD on October 13th and add to their stocking. Either way, your little Chuggington fan will have a blast watching all 6 episodes - over and over again, just like my girls have been enjoying this upcoming release. "Cool high-speed adventure is on the way to preschoolers nationwide with the newest “Chuggington™” DVD, “Chuggington: The Big Freeze”! The latest release in the popular DVD collection from Anchor Bay Entertainment is jam-packed with six fun-filled adventures – including a never before seen holiday special episode from the top-rated Disney Junior series. 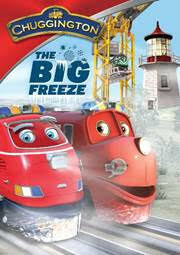 “The Big Freeze” pulls into retail on October 13, just in time to help families from coast-to-coast celebrate the season – Chuggington style! Young fans can experience even more “Chuggington” fun at Amtrak Train Days events, taking place across the country. For information visit https://contraindication/events/. Thanks to the kind folks at Anchor Bay Entertainment, one lucky reader will win a copy of this upcoming DVD to share with that special Chuggington fan in your life. To enter, please complete the entries on the Rafflecopter form below. Good luck! I would love to win this for my children, thanks for the chance.